Stage rentals by Metro DC Audio Visual: We have been providing creative, flexible and safe portable risers rental and tiered seating solutions to a vast array of events and productions for over 15 years. Whether you need small stage for hire for a private party, camera risers for film sets or bespoke structures for festivals, we are experts at providing staging for rent that's right for you. Our Platforms are the newest innovation from the most trusted name in staging. The platforms smart design is the result of extensive research, engineering and technical advancements in materials and manufacturing. The result is a staging system that is lighter, stronger, easier to handle and faster to set up. When it comes to stretching your investment across multiple needs like seated risers and performance stages, our stages sets a new standard in the rental industry. Our Signature risers were designed to incorporate every meaningful advantage: classic black styling; safe, simple setup; lightweight handling; superb stability; strong, quiet performance; easy mobility; long-lasting service; an integrated backrail with safety crossbar. The folding frame and innovative design allow you to easily change seating configurations based on the layout of the performance. Four people can install seating for 200 in about four hours. Taking it down takes even less time. The Upper Deck system is available with corner sections for better sight lines, improved traffic flow and greater seating capacity. The mobile stage trailer stems from the success of the world acclaimed Stageline SL250 stage model, which has over 15 years of innovative design. Built on the strength of the SL250 Series, the mobile stage trailer offers more trim height, more sound wing rigging capacity and easy to install covered wings for full weather protection. Our 4' x 4' Quarter-Round Stage Platform and Base lets you build the stage that fits your performance. Quarter-round platforms are perfect additions to larger stages or for highlighting solos and duets. MULTIPLE LEG LENGTHS OFFER ENDLESS STAGING POSSIBIBILITIES A variety of standard leg lengths, plus telescoping and custom leg lengths, lets you set a stage exactly as you envision it. Fixed Height legs: Available in 8", 16', 24 “, 32", 40' and 48" heights. Custom sizes available. Telescoping Legs: Infinitely adjustable between the two dimensions speced for the leg. Holes are in 2' increments. Adjustable Height Legs: These legs are inﬁnitely adjustable up or down 2" from the heinht of the leg. This optional Step Unit for Stages is made of high grade plywood edged in vinyl T-molding. Polypropylene textured grey surface and handrails prevent users from slipping. The black frame is built with 14 gauge steel tubing and clamps securely to the stage at any point. Unit rolls on two wheels for easy set-up. Black/Gray finish. 36"W x 15-1/2"D x 43-1/2"H overall. Sturdy guardrails to match our staging and seated risers are designed for easy assembly without tools. These meet or exceed most loading and rail-height building code requirements. A special IBC-Compliant guardrail (shown at right) complies with most 4" (10 cm) sphere building code requirements. 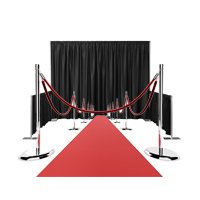 We offers stage skirting in any length and width, it will fit any stage no matter size\ length. Our Stage skirting is an easy and affordable solution to put the finishing touches on any stage. We offer four pleat different styles, Shirred, Box, Accordion or Adjustable Pleat and are available in 2 different fabrics and an 35 different colors. Our portable ramps are strong and stable, and they attach securely to Our staging units. This cost-effective ramping solution helps ensure that all performers have an equal chance to take the stage. 4'-wide (122 cm) ramps adjust to the exact height of stage elevation. Surface Options: Black Top and Carpet Top. Complete with guardrails. PORTABLE BACK DROPS FOR STAGES - Mounted on castors to roll into place quickly behind the stage or risers. Can be used at floor level or telescope the frame to adjust to the height of your stage always providing 8' of backdrop. Portable frames are 8'x8'. Double flat fold pleated drapery simply velcros to the top bar for fast and easy set up.